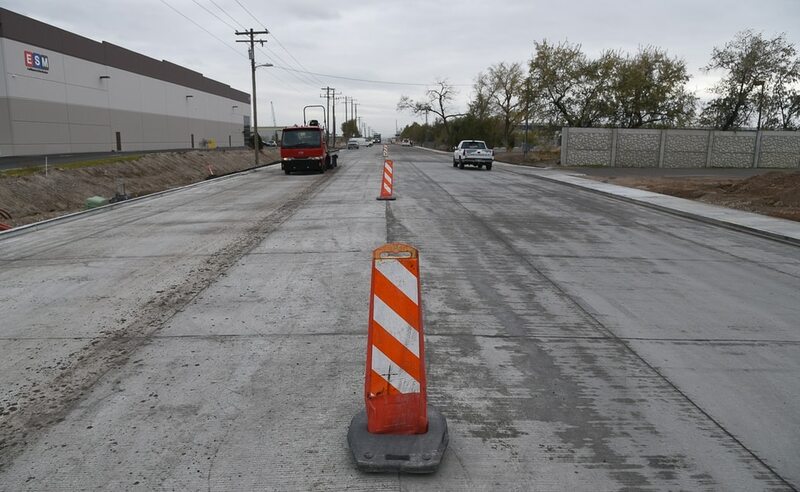 (Francisco Kjolseth | The Salt Lake Tribune) Salt Lake City officials have marked the completion of the Gladiola Street reconstruction project at 3400 West, which began in June, and was a complete rebuild of the roadway between 500 South and 900 South. The project, including wider lanes, improved curb and gutters, sidewalk enhancements, new ADA ramps, and bikes lanes is wrapping up after a City investment of $3 million dollars with plans to reconstruct another segment between 900 South and California Avenue in the next few years. 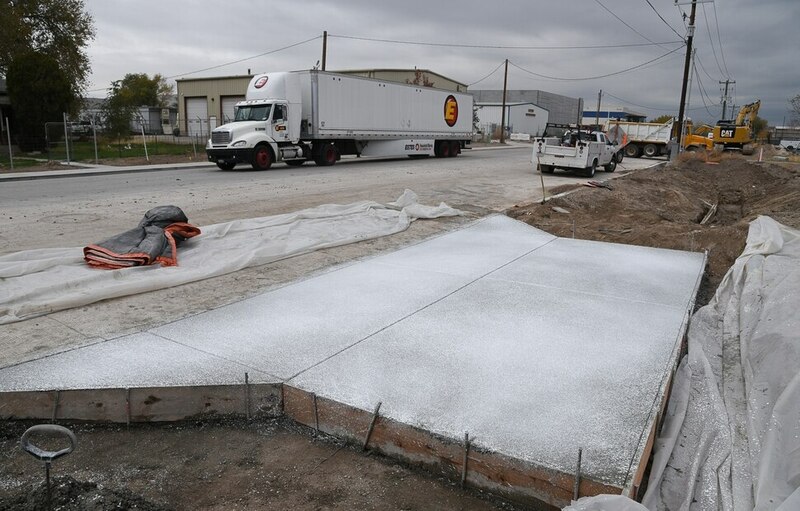 (Francisco Kjolseth | The Salt Lake Tribune) Salt Lake City officials have marked the completion of the Gladiola Street reconstruction project at 3400 West, which began in June, and was a complete rebuild of the roadway between 500 South and 900 South. The project, including wider lanes, improved curb and gutters, sidewalk enhancements, new ADA ramps, and bikes lanes is wrapping up after a City investment of $3 million dollars with plans to reconstruct another segment between 900 South and California Avenue in the next few years. (Francisco Kjolseth | The Salt Lake Tribune) Salt Lake City officials have marked the completion of the Gladiola Street reconstruction project at 3400 West, which began in June, and was a complete rebuild of the roadway between 500 South and 900 South. The project, including wider lanes, improved curb and gutters, sidewalk enhancements, new ADA ramps, and bikes lanes is wrapping up after a City investment of $3 million dollars with plans to reconstruct another segment between 900 South and California Avenue in the next few years. (Francisco Kjolseth | The Salt Lake Tribune) Salt Lake City officials have marked the completion of the Gladiola Street reconstruction project at 3400 West, which began in June, and was a complete rebuild of the roadway between 500 South and 900 South. The project, including wider lanes, improved curb and gutters, sidewalk enhancements, new ADA ramps, and bikes lanes is wrapping up after a City investment of $3 million dollars with plans to reconstruct another segment between 900 South and California Avenue in the next few years. (Francisco Kjolseth | The Salt Lake Tribune) Salt Lake City officials have marked the completion of the Gladiola Street reconstruction project at 3400 West, which began in June, and was a complete rebuild of the roadway between 500 South and 900 South. The project, including wider lanes, improved curb and gutters, sidewalk enhancements, new ADA ramps, and bikes lanes is wrapping up after a City investment of $3 million dollars with plans to reconstruct another segment between 900 South and California Avenue in the next few years. (Francisco Kjolseth | The Salt Lake Tribune) Salt Lake City officials have marked the completion of the Gladiola Street reconstruction project at 3400 West, which began in June, and was a complete rebuild of the roadway between 500 South and 900 South. The project, including wider lanes, improved curb and gutters, sidewalk enhancements, new ADA ramps, and bikes lanes is wrapping up after a City investment of $3 million dollars with plans to reconstruct another segment between 900 South and California Avenue in the next few years. 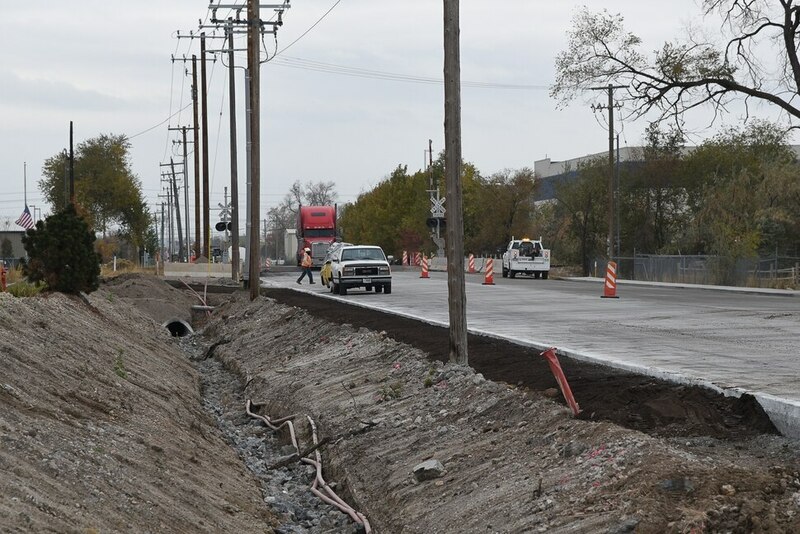 (Francisco Kjolseth | The Salt Lake Tribune) Salt Lake City officials have marked the completion of the Gladiola Street reconstruction project at 3400 West, which began in June, and was a complete rebuild of the roadway between 500 South and 900 South. The project, including wider lanes, improved curb and gutters, sidewalk enhancements, new ADA ramps, and bikes lanes is wrapping up after a City investment of $3 million dollars with plans to reconstruct another segment between 900 South and California Avenue in the next few years. Salt Lake City officials highlighted the completed $3 million Gladiola Street reconstruction project on Thursday, days before voters were set to weigh in on the $87 million road bond on their ballot. Construction began on the complete rebuild of the roadway between 500 South and 900 South back in June. The finished product includes wider lanes, and the addition of bike lanes and sidewalk enhancements, like new ramps. To celebrate its completion, Mayor Jackie Biskupski and Councilman Andrew Johnston joined project team members in planting a ceremonial tree along the corridor, with an additional 40 trees expected to be planted in the coming months. City officials also announced that the Streets Division will hire a new street maintenance crew, funded as part a sales tax increase approved by Biskupski and the City Council in early 2018. The new crew will allow the city to double the number of lane miles maintained on an annual basis, including resurfacing and pothole repair. Salt Lake City voters will have the final say on Tuesday on a road bond city leaders say is needed to fix failing streets. Two-thirds of Salt Lake City’s roads are in poor or worse condition, according to a pavement survey the city commissioned last year. The backlog is a result of aging streets, coupled with a lack of prioritization and underfunding in city budgets for maintenance before and after the Great Recession. If voters give it a green light, the bond would likely add $5 in annual property taxes per household. If it fails, the city estimates that average property taxes would decrease by $41.35. That’s because the city is paying off existing bonds in 2019 for the Main Library and the Leonardo museum, so residents will no longer see tax bills for those. The roads won’t stop deteriorating if the bond measure doesn’t pass, but Biskupski and Council Chairwoman Erin Mendenhall have said they want to see what happens with the bond before coming up with a Plan B.